AI Replacing Executive Decision Making? An AI Primer. What do we think it is Today? Pizza Service with a Cognitive Smile? Can Procter & Gamble Find its Way? Another potential commercial example of virtual assistants ... Natural extension for Cisco which is already providing advanced business technologies. No cute anthropomorphic name as yet? How conversational will it need to be? Will it need to learn and retain corporate culture? Adapt to patterns of usage? Tool versus assistant? IBM’s Verse email platform and Connections collaboration suite are a good match for Cisco products like the Spark messaging app and WebEx conferencing service, so the two vendors have found ways to integrate them, company officials say. All this will happen in the cloud. They’ll demonstrate the first examples next month at the Cisco Live conference..... "
In the July issue of the Communications of the ACM. 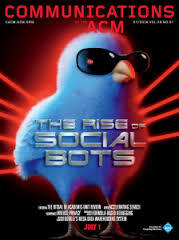 The cover article is "The Rise of Social Bots"
Good background, future, value and cautions. Not very technical. I like adding the adding of 'social' to the description, ultimately they must be able to work with us. Very memorable points as it matched with our own experience in this area. Bots (short for software robots) have been around since the early days of computers. One compelling example of bots is chatbots, algorithms designed to hold a conversation with a human, as envisioned by Alan Turing in the 1950s.33 The dream of designing a computer algorithm that passes the Turing test has driven artificial intelligence research for decades, as witnessed by initiatives like the Loebner Prize, awarding progress in natural language processing.a Many things have changed since the early days of AI, when bots like Joseph Weizenbaum's ELIZA,39 mimicking a Rogerian psychotherapist, were developed as demonstrations or for delight. Today, social media ecosystems populated by hundreds of millions of individuals present real incentives—including economic and political ones—to design algorithms that exhibit human-like behavior. Such ecosystems also raise the bar of the challenge, as they introduce new dimensions to emulate in addition to content, including the social network, temporal activity, diffusion patterns, and sentiment expression. A social bot is a computer algorithm that automatically produces content and interacts with humans on social media, trying to emulate and possibly alter their behavior. Social bots have inhabited social media platforms for the past few years. .... "
Interesting McKinsey overview with statistics. Having dealt with regulatory data issues in the EU, had always thought they were forced to be more digital as a result. The article says otherwise, and that there is considerable economic growth potential as a result. Nicely done talk today by Ken Forbus of Northwestern. Sobering view of what AI can do today. So what is intelligence? I was always somewhat unsatisfied by the Turing test. Its not about fooling people into thinking a system is smart. It is not about imitation. It is about operating sufficiently well and usefully in social situations. Social here can just be a conversation with two or more people or systems. It often includes a strong learning element. Learning in a general way but also learning about the current and local context of an interaction. Despite all the bot and 'assistant' and integrated natural language claims, we are still come distance from doing that effectively. Forbus has some interesting work underway. More about Forbus' work. Did not mention much about the specifics of measurement, want to see more about that. Kenneth Forbus “Software Social Organisms: Implications for measuring AI progress” Northwestern University Slides. Recording. Podcast: In his new book, Invisible Influence: The Hidden Forces That Shape Behavior, Wharton marketing professor Jonah Berger takes us inside the conscious and unconscious ways that social influences shape our decisions. Knowledge@Wharton recently had an opportunity to talk with Berger about his book. .... "
Have examined related problems, like the legal examination of contracts. So not unexpected we are seeing attempts for legal AI to replace elements of expensive services. In Inc. IN THE PAST two years a group of researchers in Israel has become highly adept at stealing data from air-gapped computers—those machines prized by hackers that, for security reasons, are never connected to the internet or connected to other machines that are connected to the internet, making it difficult to extract data from them. .... "
In CACM: More on robotic touch out there. Here an eye is added to a hand. Don't remember seeing something similar. " .... Carnegie Mellon University (CMU) researchers have developed Articulated Robot Motion for simultaneous localization and mapping (ARM-SLAM), a new technology that includes a camera attached to a robot's hand that can rapidly create a three-dimensional (3D) model of its environment and locate the hand within that 3D world. ... "
" .... With the emerging ecosystem of connected devices – often dubbed the “Internet of Things” – consumers are rightly worried about the security and privacy implications associated with always-on hardware in their homes that listen, watch, observe and then store data in the cloud. Today, a company called Silk Labs, co-founded by former Mozilla CTO Andreas Gal, is launching a device that aims to address those concerns with its smart home sensor dubbed “Sense” that interoperates with your home’s connected devices, and automatically adapts to your needs over time by learning from your behavior and patterns. Cisco blog looking at the basic elements of digital transformation. The details still need lots of work, and they need to be forward forecast against likely technology changes. It remains a big question what kinds of decisions AI will be able to replace in the short and longer term. For the executive, it is not too much different than other 'assistant' roles, but with different focus and scope of data. Might be a time to look at some of the work we did with executive information systems. More understanding of the risk behind decisions, Better forecasts. Better collaboration, inside and outside the enterprise. Security. Better simulation of choices. Very clear explanation of analytics used. Clear measurement. MIT Sloan takes a look. . Please point your web browser to https://apps.na.collabserv.com/meetings/join?id=2894-8491 password=cognitive. Use audio on computer or 855-233-7153 in the US (other countries numberhere) PIN Code: 43179788 Non-IBMers and Non-Members, please use the "guest" option instead of entering your email. Please find the schedule of presenters herefor the next several calls. A link to slides and a recording of each call should be available on the CSIG website (http://cognitive-science.info/community/weekly-update/). (Slides will be linked to here later) On Ken Forbus. You can now enable an Amazon Echo skill by just asking for it. Makes lots of sense. Does assume you know the name of the skill and how it works. More important, providing more and better skills.There are now some 1400 examples. And then interconnecting skills as services. In The Verge. We were closely involved in the knowledge architecture for bots for consumer interfaces, so this is a very interesting development. How does this adapt to the conversation? The goals of the participants? The risks of error? The opening questions are important, how will this help people? Good to follow. Do you need a bot to talk to your bank? Dror Oren, VP of Product for Kasisto, thinks it's about time that the likes of Facebook, Microsoft, and Google caught up. His company has quietly been building the infrastructure (and getting funding) for bots for a couple of years. Today, it's unveiling a banking bot — so you can chat with it instead of dealing with the bank's website, app, or (heaven forbid) calling in to customer service. Or at least, that's the idea. For Kasisto, the primary target market is actually the banks — so it's releasing two bots. But before we get to the bot meant for banks, let's start with the one you can actually use, designed for for consumers. Though it's functional, it's more of a proof of concept than actual product. Called MyKAI, you can use it to query data from your various banking accounts. It's a little bit like Intuit's Mint service, but in a chat interface. ... "
Converting Numerical to Categorical variables. Simple, largely non technical piece on the topic. Whats nice about this approach, when appropriate, is that it can be readily explained to those that own the decision process. So it can be determined to be both statistically and decision ownership correct. Video of project Tango, using a smartphone, here used to map and discover contents of a Barcelona complex museum floor. Consider retail applications to make navigation, discovery and engagement more intelligent. With existing smartphone hardware. Further connection with Beacon technologies that associate for engagement? Amazon is looking to deepen its ties to the education world with a new online marketplace for lesson plans, curriculum, and other resources that debuted on Monday, called Inspire. Until now, Amazon’s presence in educational institutions has been mostly limited to its original business of selling digital and physical books. The e-commerce giant has partnered with a handful of universities to open co-branded online bookstores for selling textbooks and a number of physical campus stores as package pick-up centers. .... "
More buttons in the home for retail. Not sure how far this will go without Amazon's marketing muscle. Will homes be outfitted with standard needs buttons? Be commissioned to include an array of buttons as a loyalty or subscription play? What would it need to get you to display an array of buy buttons on your frig? I can see some possibilities. Promising to be a viable alternative for consumers to Amazon Dash, Tel Aviv-based Kwik is launching a “one-tap” smart button and delivery service in the U.S. Launched in 2015, Kwik provides one-tap delivery for Domino’s Pizza, Huggies Diapers, and Eden Springs Water in Israel. Kwik also won a pilot program with Anheuser-Busch during the AB InBev & ZX Ventures Startup Pitch Competition at SxSW. Customers register for a button, connect it to their home Wi-Fi, choose their default product(s), and push the button to place their order. In seconds, a text message arrives for confirmation, and the product arrives shortly thereafter. Kwik earns a cut from each purchase. .... "
Particularly interesting suggestion of how people are 'intelligent'. Northwestern Engineering’s Ken Forbus is closing the gap between humans and machines. Using cognitive science theories, Forbus and his collaborators have developed a model that could give computers the ability to reason more like humans and even make moral decisions. Called the structure-mapping engine (SME), the new model is capable of analogical problem solving, including capturing the way humans spontaneously use analogies between situations to solve moral dilemmas. See more on Structure Mapping Engines (SME). In Supermarketews: Shows the direction of retail to better understanding of the art and science of food. Reminds me of our own work in innovation, can focus on engagement, fun, future.
" .... Yet it would be a mistake to think the IoT is a game only for high rollers and crack technologists. Our research and client engagement experience has shown us that generating strong returns from the digital sensors, wireless communications devices, digital cameras installed in buildings and other smart, connected devices does not come down to writing big checks or being technologically savvy. The companies with the greatest value from IoT to date are the best at dealing with how products are performing for customers. .... "
" ... For decades, one-off marketing campaigns were the biggest game in town. Since the rise of the internet, however—and, in particular, the rise of social media— customer behavior has changed dramatically. Not only has social media become an essential tool for any marketing strategy (almost half of Facebook users have “recommended” a brand), customers today also expect their relationship with brands to go beyond the use value of their products. For Mohan Sawhney, clinical professor of marketing and McCormick Foundation Chair of Technology at the Kellogg School, that means it is time for marketing leaders to embrace a different approach. ... "
" .... So what is a quantum computer and “qubits” — especially as compared to a traditional computer and bits? What is Grover’s Algorithm? And besides speed of processing, what are some of the new applications that wouldn’t have been possible before? From how traditional computers work and quantum computers will work to why this all matters, a16z Deal and Research team head Frank Chen walks us through the basics of quantum computing in this slide presentation. And even though may feel like you finally understand after watching this, just remember what Feynman once said: “If you think you understand quantum mechanics then you don’t understand quantum mechanics.” ... "
Adventures in math metaphors for teachers and parents. How to you teach what most students fear, even to the very young? Pass it on. In Reddit. Bernard Marr concisely writes on the 'little data' of performance metrics. This links well with my constant refrain, the data, big or otherwise, however cleverly analyzed, is only good as far as it relates to business process. And the key measure of process is performance. See my previous writings on KPI at the link below. Design Thinking is not a Problem Solving Tool. Start believing that it is one of the most natural ways in which one can imagine growth. It is a method that generates Growth; Engineering Value, Integrating Intellectual and Human Capital. Growth that is Societal, Inclusive, Innovative in nature and Creates Wealth. One that ushers the New or in other words responsible for the process of Renewal through Creative Destruction. Problems are the Cause of poor design in the first place. They also occur when there is a shift in the context in which the present operates from a previous design. The outcome of Design Thinking is always a Point of Departure from the Present into the Future. It obviates a problem by addressing the higher layers of Solution in terms of New Ideas / Concepts, New Opportunities, New Objectives and New Events. .... "
Although this seems more about writing it very large than getting it correct and interactive and usable by everyone. Just lately noticed the similarity between the concept of a graphical databases and data visualization. So why not use graph visualization to best understand broad, rich and dynamic data resources in a data lake? Make them 'smart' by adding semantic relationships. In Datanami: " ... Data lakes are synonymous with Hadoop to many people grappling with the promise and the peril of big data. That’s not surprising, considering Hadoop’s unparalleled capability to gobble up petabytes of messy data. But for Barry Zane and other folks at Cambridge Semantics, data lakes are taking on a decidedly graph-like appearance. Cambridge Semantics, which acquired Zane’s latest startup SPARQL City earlier this year, is beginning to talk about its concept of the smart data lake. The data lake concept is a well-worn one by now. The “smart” part, you may have guessed, owes to the semantic aspect of how the data is stored, how it’s connected to other data in the lake, and the way it impacts how people can extract meaningful information from it. ... "
Interesting piece out of the IFTTT blog. Here with GMail. This shows a pretty trivial example of how to look at a stream like your GMail, apply some logic intelligence to it, and alert you to related needs. I don't think the specifics of the example would be useful to me, but the idea is well presented. Adding more complexity to the logic, algorithms, pattern matching would be useful as well. How might Microsoft Flow work with the same idea? A meta conversation with your email, but not a very deep one. I had mentioned this idea before, because it could detect both traffic and the type of traffic being experienced. We examined methods of this type. Now, how to use that kind of data for predictive analytics. Its still hard to do many of the 'simple' tasks that are done in the home. But at least we can prototype a number of them with robot like machines. But when will the robot sweeper learn to fold clothes, do and put away the dishes, clean the windows, walk the dog? The machines may get smart, but when will they get mechanically able and versatile? And combine into just a few chore masters? More in Techdirt. Set up flows that instantaneously deal with critical emails, notify the whole team whenever a work item is updated, or capture, track, and follow up with new sales leads—almost anything, all automatically. ... "
Nicely done and non technical via SAS. It is interesting that I do not hear the term 'cognitive computing' too often by vendors, except for IBM. Gotten into some mild arguments about what cognitive means here. I take it fairly broadly ... anything that includes skill we would see as human-like. Language processing, learning, non trivial reasoning, abstract reasoning, Process organization, analogical reasoning, image recognition .... And now we expect computers to be faster, at least serially .... and to have limitless searchable memory. Then as we progress the expectation moves forward. I note that the Institute for the Future: IFTF, a nonprofit company I worked with for years, wrote for as well, has a Maker City Project underway. They are publishing a handbook on the topic chapter by chapter. The aim is to create urban revitalization using a combination of 'maker' mentality and technology. You can see the some of the usual cities mentioned, but also many medium sized cities. See the free handbook here, now up to chapter 5, with quite a lot of detail. A little too much expectation that you can regulate and influence all the things involved. Too many west coast reasons. Interesting read. Will try to follow. My recent connections to developing curriculums and teaching have made me think about all aspects of teaching and supporting teaching. With all the technologies possible today ... What is the future of textbooks? Work out of Penn State. Fileee is an intelligent, personal assistant that automatically organizes all of your paper and digital documents in one system. It’s the new filing cabinet of the future, including personal assistance that recognizes the structures and information of your documents. ... "
This is probably the most important need for the knowledge worker. Attempts like Google Intranet search, internal Wikies and Zakta have been used to address this. Recently have seen examples of how Watson is being used at more depth, and most examples I have seen are also mostly about how to gather all your data, and external data, in all its forms, and apply it to specific contexts of need. Hardly a secret weapon. And managing it and understanding how well is works is still an issue. But its always worth examining. What is particularly nice is that is is relatively easy to scale these days with new tools and social connectivity to possible users. Further, MYcrowd.com.
" .... Kurt VanLehn, Diane and Gary Tooker Chair for Effective Education in Science, Technology, Engineering and Math in the Ira A. Fulton Schools of Engineering at Arizona State University, gave a great presentation today on “Classroom Centaurs: A new genre of educational technology” as part of our Cognitive Systems Institute Speaker Series. Please continue the conversation here with Kurt, who's research can be found here: http://www.public.asu.edu/~kvanlehn/VanLehnVita.htm To see and hear a replay of today's presentation, go to: http://cognitive-science.info/community/weekly-update/ and select recording next to June 23, 2016 presentation. .... "
Good discussion on Samsung's smart Frig. Apparently not a prototype and is for sale. The the cost is hefty Is the refrigerator the place for the home hub? Akin to Story telling, Recall my mention of the local grocery chain Jungle Jim's. Personally I think they should do more in that space to tell fun stories to attract and engage customers. Maybe with screens or ultimately with robotics. 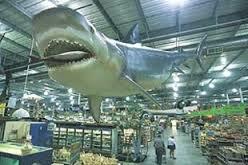 At the right is the monstrous Jungle Jim's Shark. Not too much of a comes story with it yet. Like the idea. When we will see a library of these efforts to consider? What are the bounds of its innovation, creativity? The words Artificial Intelligence can bring to mind far-fetched, sci-fi ideas and a society where robots have replaced humans. Well, this idea may not be too far off given Google’s recent innovations. Even though its first melody sounds like a generic song pre-programed to a keyboard, the project is considered a success because the system taught itself. The system composed the 60-second melody with little human intervention. .... "
Not unexpected, but how well will it work compared to broader prediction?
" .... Things are clearly progressing rapidly when it comes to machine intelligence. But how did we get here, after not one but multiple “A.I. winters”? What’s the breakthrough? And why is Silicon Valley buzzing about artificial intelligence again? From types of machine intelligence to a tour of algorithms, a16z Deal and Research team head Frank Chen walks us through the basics (and beyond) of AI and deep learning in this slide presentation. .... "
I have been through all this myself, are we there yet? And where is that? Here is one take. A very simple idea. Developers can add interactive buttons in Slack. Of really any level of intelligence they can 'develop', from very simple logic to far beyond. Have been a user of Slack for a while and can see how this could be useful. The Will be interesting to see how far this will be taken. Adding buttons into Slack Apps may not seem like a major feature, but it actually makes it easier for third parties to integrate their applications with Slack. That’s because the buttons make it easier for developers to get user input without having to parse plain-text responses. .... "
Much anticipated. 2nd edition. Pre order it. By colleague Herb Sorensen who we used for shopping innovation. An ideal companion to our new world of advancing analytics in retail. This connects science to store behavior in ways that are essential to design, analysis and delivery of retail results. I am reading and will be excerpting through the year.
" ... What do you really do when you shop? The answers are fascinating and, for retailers, they're cash in the bank. In Inside the Mind of the Shopper: The Science of Retailing, world-renowned retail consultant Dr. Herb Sorensen, Ph.D. uncovers the truth about the retail shopper and rips away the myths and mistakes that lead retailers to miss their greatest opportunities. Every year, says Sorensen, shoppers will spend a quadrillion seconds in supermarkets and they'll waste 80% of that time. Sorensen analyzes consumer behavior–how shoppers make buying decisions as they move through supermarkets and other retail stores–and presents powerful, tested strategies for designing more effective stores, improving merchandising, and driving double-digit sales increases. He identifies simple interventions that can have dramatic sales effects, and shows why many common strategies simply don't work. You'll learn how to appeal to the "quick trip" shopper; make the most of all three "moments of truth"; understand consumers' powerful in-store migration patterns; improve collaboration between manufacturers and retailers; learn the lessons of Stew Leonard's and other innovators; and much more. Then, in Part II, Sorensen presents revealing interviews with several leading in-store retail experts, including crucial insights on using technology and retailing to multicultural communities. ... ? In O'Reilly.Nicely put, requires registration for full report. I still prefer the term 'analytics' for this. But ML is sexier these days. This report introduces contemporary machine learning systems, but also provides a conceptual framework to help you integrate machine-learning capabilities into your user-facing designs. .... "
Elon Musk looks at a yet harder problem, the robotic housekeeper. A problem of complex environments. Brought back to my attention, Rulex: More to follow. Data Monetization means gaining measurable financial value from stored and available data. It could be using customer and transaction data to increase predicted Customer Lifetime Value, selling business data to partners for marketing analytics, creating valuable new data products from diverse sources, or providing new kinds of analytics services for traditional business and the Internet of of Things. Rulex is a unique new machine learning platform designed for business and data analysts. Rulex enables them to extract maximum value from Big Data assets without the need for math, programming, or experimentation. Learn more about Data Monetization. .... "
" .... When the Febreze Home internet-connected plug-in air freshener arrived in the mail this month, I opened the box and beheld yet another questionable impulse buy. I ordered it during this year's Consumer Electronics Show in January just after Procter and Gamble announced it. If this was a typical Kickstarter project, it would have arrived in time for the 2017 holiday season after several competitive products already hit the market. P&G actually stuck to its promised ship date, which is the most remarkable aspect of this product's debut. .... This harbinger of the connected home offers a whiff of what's ahead for marketers, manufacturers and consumers. .... "
" .... Amazon is just beginning to use robots in its warehouses and they’re already making a huge difference .... Amazon acquired Kiva for $775 million in 2012 but only started using the orange robots in its warehouses in late 2014. The deal was expected to make inventory management more efficient. It’s now beginning to become clear by how much. ... "
Ants avoiding traffic. Reminds me of swarming algorithms for tracking or searching. Considered it in warehouses. Have used Waze from time to time but have never had it direct me 'algorithmically'. Doubt if many people do. I do think this might be just the thing for self driving cars. Once people trusted the swarm.
" ... Wal-Mart will "reimagine retail again" through efforts that support and engage store associates, serve shoppers and communities and enhance the retailer's commitment to emerging technology, President and CEO Doug McMillon said. The company will invest in technologies such as grocery delivery, while maintaining its human touch through investments in its workforce. "As the world becomes more digital, it will be the humanity of Wal-Mart that differentiates us and wins with customers," McMillon said. ... "
I think this is more than just about handling big, varied and volatile data from many sources. Have seen this poorly done. Its about having the analytics and data handling capabilities in place to 'operationalize' ,,, that is, systematically use and re-use data and methods and applications. Also the most useful organization of the data to match it to process. Such as semantic methods. And implementing the results inside business process. Ultimately automating many of these processes. More thoughts in Datanami. Right now, businesses of all shapes and sizes are struggling to find the next disruptive, digital idea that will lead to exponential growth and hefty profits. We all know how companies such as Uber, Airbnb and LinkedIn have used digital platforms to re-create the entire customer experience. However, what many people do not realize is that a whole new way of thinking helped drive these new innovations in digital business. .... "
William James speaking on a number of very modern concerns. In Brainpickings: " .... Attention … is the taking possession by the mind, in clear and vivid form, of one out of what seem several simultaneously possible objects or trains of thought, localization, concentration, of consciousness are of its essence. It implies withdrawal from some things in order to deal effectively with others, and is a condition which has a real opposite in the confused, dazed, scatter brained state which in French is called distraction, and Zerstreutheit in German. .... "
Word that Pizza Hut plans to soon test robots for customer service in Asia. We examined much simpler kiosk-style interactions in retail. Do androids with AI driven service style do better? Cognitive with a smile? Plus a further economic argument. More on driverless carts in retailwire. And a discussion. Maybe its not the smart of carts that is important, but the inconvenience. Now have been involved in several 'next generation' examination of AI and development systems, and understanding is itself still lacking. That conclusion was taken from a new survey of IT executives about the adoption of intelligent, AI-based systems and machines in the enterprise. However, the survey, sponsored by IT management software firm Ipswitch Inc., warned that early adopters have not yet gotten to grips with the security and access risks posed by delegating tasks to bots and other autonomous systems. ... "
Hardly rules, more like general usefulness guidelines. Would like to see more detail here. What works for real enterprise examples?
" ... Ching-Huei Tsou, from IBM Watson Research,who will present "Toward Generating Domain-specific / Personalized Problem Lists from Electronic Medical Records." Slides. Recording. Please find the schedule of presenters herefor the next several calls and please sign up for making a presentation by sending a note to me (fodell@us.ibm.com). A link to slides and a recording of each call should be available on the CSIG website (http://cognitive-science.info/community/weekly-update/). .... "
Ultimately its about how how to apply data and analytics to decision making. Bernard Marr does a good job with some straight forward steps in Forbes. Fairly short and to the point. Makes the important point about how it should be integrated with strategy. Though my experience is that is somewhat harder, dealing with business hearts and minds. Recently been involved in the process of addressing data quality. Key for any analytics. A general look. One other way to think of this is to use semantic data management tools to create precise statements of the knowledge that sits behind the data. Examined that with Stanford KSL a while ago. That ultimately evolved to the package Protoge. Most recently took a dive into the impressive package Top Quadrant. What other large entities are doing this?
" ... Theano is an open source project released under the BSD license and was developed by the LISA (now MILA) group at the University of Montreal, Quebec, Canada (home of Yoshua Bengio). It is named after a Greek mathematician. At it’s heart Theano is a compiler for mathematical expressions in Python. It knows how to take your structures and turn them into very efficient code that uses NumPy, efficient native libraries like BLAS and native code (C++) to run as fast as possible on CPUs or GPUs. .... "
Very detailed article on the subject. " .... (recently) at the WWDC keynote, Apple announced a series of new security and privacy features, including one feature that's drawn a bit of attention -- and confusion. Specifically, Apple announced that they will be using a technique called "Differential Privacy" (henceforth: DP) to improve the privacy of their data collection practices. ... " . Had not looked at Platfora ... Here integrated with Spark. I see discovery as different than typical machine learning. Not too dissimilar from data visualization, where the human visual system does the pre discovery, and potential linking to useful business decision results. it is worth making the distinction. In BizJournals: Kroger thinking about getting into the 'Blue Apron' prepared food component delivery market. Good margin, inventory in stock, I am sure, but what is the potential market? Posted in the Cognitive Systems Institute via Jim Spohrer. Thuoghtful piece. Exploring some of the myths about AI. by Robert D. Atkinson. Lengthy, 40+ pages, but non technical exploration of the issue: " .... Coupled with the widespread job destruction following the great recession, AI has become a fixture in the news (and the movies), looking alternatively promising and threatening ... "
All systems that predict future states need to predict future related context. No one can be sure where oil prices are headed. McKinsey’s Scott Nyquist answers the questions business leaders are asking about the state of the market. .... "
Last week, Dennis Trchka laid out Four Steps to Unlocking Supply Chain Value. The first step, documenting current processes, is the foundation from which opportunities to realize both bottom line savings and top line growth begin to appear. A Process Map (PM), quite literally, gets everyone on the same page. It’s a great visual aid that helps everyone in the organization “see” how a product moves through the supply chain, identify gaps and pain points, and begin to brainstorm new approaches and solutions. During my 30-year tenure at P&G, I led a vast number of Process Mapping exercises across pharmaceutical, OTC and non-healthcare consumer product categories. We mapped activities as diverse as manufacturing forecasting, start-up processes, international shipping, warehouse utilization, and even personnel hiring. In every case, the exercise resulted in “aha” moments of discovery that led to specific action steps and operational improvements. .... "
Saw this annoncement from WWDC. A near requirement after Echo moved in this space. Depends too on precisely what 'open source' means here. How narrowly is the API defined? Will the connection include some of the later developments from Viv? How are needed services defined? How is learning included and defined? Lots of questions remain. As widely expected, Apple is lavishing TLC on its voice assistant, Siri, at this year’s WWDC. The company has just announced it will be letting developers bake Siri’s voice functionality into their apps — so users will be able to tap into third-party services just by saying ‘Hey Siri…’. While there are some Siri third-party integrations already, such as Siri’s ability to perform look ups via Yelp, for example, or search for content on Twitter, the new capabilities greatly expand the potential for iOS users to call upon Siri, once developers start plugging their services directly into the voice interface. .... "
" ... Apple has joined Amazon in offering an intelligent voice interface as a service. Siri—until now inaccessible to developers—will allow third-party apps to offer their services inside the Siri interface through an SDK called SiriKit. ... "
More movement toward conversations, bot style, AI. Read my Bots tag below for some of our experience in this space. Bots have an element of 'cognitive' in the form of human conversations. Like those that Cortana uses. What elements of intelligence do they represent? The software attempts to spare users the hassle of switching between apps by making it possible to interact with every service on their phones through a centralized chat window. The built-in bot can be instructed to find a restaurant on Yelp, add a song to an iTunes playlist and even change the settings on connected devices like the Nest Thermostat. It’s an appealing value proposition, but Redmond appears to be more interested in the Wand team. Microsoft veep David Ku dedicated half the blog post in which he announced the acquisition to praising founder Vishal Sharma and his 7-person team. ... "
Twit podcast on the motivations of Microsoft acquiring Linkedin. Useful thought piece. 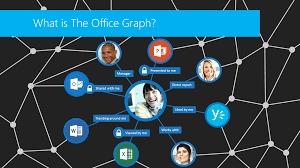 Mention of Office Graph. Privacy implications. Continuing to follow. Emphasis on a social channel with much less noise. Value of real networking connections. Also they get skill delivery group Lynda.com with the purchase. (Update) The three journalists that did this podcast provided good insight. Implications with connections to Skype. But I note that of the three, none of them were active users of LinkedIn. Also mention of Internal company functionality we had looked at. Will this encourage those efforts? Famed robotics innovator, we linked with for home applications with IRobot, talks AI and related robotics. Interesting idea, not read yet, but having worked with many algorithms and I think we are a considerable way from doing this ..... But we are working with business process that can be directed and then improved by algorithm. How different are algorithms from 'rules' to live by? New book. I recall this being proposed for generating advertising or architecture art images from sketches. It is an example of providing artistic imagery skill to non artists. Or augmenting typical human skill. In Technology Review. In Bloomberg. This is different from the 'smart cart' idea heavily prototyped previously. Now including self powering and navigating features. Previously self-driving shopping carts were not mentioned.
" ... Wal-Mart Stores Inc. is working with a robotics company to develop a shopping cart that helps customers find items on their lists and saves them from pushing a heavy cart through a sprawling store and parking lot, according to a person familiar with the matter. Such carts are an emerging opportunity for robotics companies as brick-and-mortar stores look for innovative ways to match the convenience of Amazon.com Inc. and other online retailers, said Wendy Roberts, founder and chief executive officer of Five Elements Robotics. ... "
Early on had an introduction to the optimization of computer chip making. Fascnating piece here on the state of the art of chip making today. In Bloomberg. New piece on how to get started with Watson Analytics, worth a closer look. Good user experience in place. Question remains how autonomous such systems can be, and who their users will be.
" .... LinkedIn continues its strategy of developing hot technology and open-sourcing it, this time a machine learning library for Spark called Photon ML. LinkedIn announced that it has open-sourced its machine learning library for Apache Spark, known as Photon ML. Apache Spark is an open-source cluster computing framework used for processing and analyzing big data. The open-source data processing engine was built for speed, ease of use and sophisticated analytics. Spark is designed to perform both batch processing and new workloads like streaming, interactive queries and machine learning. ... "
" ... Last year, Facebook began giving marketers more information about the people who were nearby their stores. Now, it's building on that, giving advertisers data about those who were served an ad and then traveled into a store, as well as adding features to its local ads designed to make store location easier for consumers. Facebook is also letting advertiserx link transactions to ads with the help of companies like IBM. ... "
We looked at the ability to create soundscapes in environments. And then inserting sounds to create changes in context. This is different, but signiticant for the same goals.
" .... Researchers from MIT's Computer Science and Artificial Intelligence Laboratory (CSAIL) have demonstrated an algorithm that has effectively learned how to predict sound: When shown a silent video clip of an object being hit, the algorithm can produce a sound for the hit that is realistic enough to fool human viewers. This "Turing Test for sound" represents much more than just a clever computer trick: Researchers envision future versions of similar algorithms being used to automatically produce sound effects for movies and TV shows, as well as to help robots better understand objects' properties. .. "
An interesting play, for a mere 26 Billion dollars. I was involved with looking at Linkedin as an enterprise package for sharing internal connections and expertise. Can we expect to see this pushed by Microsoft, hopefully cleanly integrated with systems like Skype? In particular how the architecture used by a company like Linkedin can be used securely and at scale, for connections to both internal and external sources of expertise. Does it have this value? It comes pre-loaded with a large percentage of focused global professionals. Imagine the possibilities for service based applications. More. (Update) I was reminded of Microsoft's Office Graph, and here in PCWorld. which has similar purpose. And could be well driven by the Linkedin knowledge. Also Cortana, which should also be intelligently interconnected, I hope they do a better job than they have done with Skype integration. Saw this demonstrated at the Apple development conference yesterday. Nicely done. An App for the iPad. I can see some kids getting excited by the step by step aspect of learning this kind. of coding. Incrementally rewarding. Ultimately this is an introduction to programming concepts, not real projects. Having coded for years myself, it requires a kind of meticulous attention to detail that not everyone has. Swift has been around for some time and is open source. More in Techcrunch. In Fortune. Fascinating piece on my former career manager Procter & Gamble. Which includes changes on their innovation process and management influence. Largely agree with the points made.
" .... On the ninth and 10th floors of Procter & Gamble’s ... Cincinnati headquarters, in a secure area that few are permitted to enter, sits the company’s Retail Innovation Center. The “I,” as it’s known, is slick and highly digital. P&G’s top executives believe it contains the ingredients of the company’s coming turnaround. The center, which existed at another location for years but was revamped and moved in 2015, aims to tell P&G’s story to its major customers. There are video case studies of disrupters, from Uber to Airbnb. There are mocked-up shelves of both P&G’s and competitors’ products and rooms set up to show P&G items in their intended habitats (such as a baby’s room with a diaper table in a suburban home and a laundry setup in an apartment). One room is being prepared for a feminine-care presentation, with lingerie, pads, and tampons demonstrating various levels of absorbency. This is serious business. ... "
" ... There is hope for in-store beacons yet, but the primary ways retailers have been implementing them thus far have been the wrong ones. That was the main takeaway in a session given by Adam Silverman, principal analyst at Forrester Research, accompanied by Jeff Douglas, general manager of e-commerce at Nebraska Furniture Mart, at the Internet Retailer Conference and Exhibition in Chicago last week. In his presentation, Mr. Silverman showed that, in response to the question, “How interested would you be in allowing your smartphone to interact with beacon technology in a store environment to help offer the following contextual experiences?” special offers, loyalty rewards and rewards for checking in to the store topped the list. These results, however, may be deceptive, as they could reflect customers’ stated desires and not actual behavior. ... " by Matthew Stern. In the BBC: Good points made. " .... There’s a counter-intuitive downside to collecting vast amounts of information about economics and human behaviour: it can mean we ignore the lessons of history. ... " . This also happens for built-in reasons, older data has usually not been gathered in the same way as newer data. Examining the broader premise. Have examined various kinds of audible experiences, including book reading online. Here is the Audible team from Amazon. Via David Ing, in CSIG. We are all experiencing overload, produced in part by the very systems that are meant to augment us. Cognitive overload is beyond AI as a challenge for IBM, says Ginni Rometty in Kara Swisher interview at Recode conference. T-shaped breadth in cognitive computing has depth in industry domain knowledge. Beyond teaching-learning reading and mechanical skills, new jobs will need data skills. ... "
This from IOT Central. These are fairly obvious examples, and lack much depth regarding the specific issues each industry involves. But is worth a scan for anyone interested in how widely the idea is being applied. Join us at IOT Central to get further details of its application. Teaching Italian cooking using telepresence. As a long time amateur cook, nice to see the example. We have had seen visual expertise delivered for a long time. How does the movement to the interactively virtual provide additonal value? Deeper personalization too. Connections to applicable knowledge too. May be learning there. In Statnews: Google does not yet quite deliver on 'instant' medicine sci fi .... Tricorder still not ready for delivery three years later. Still a hard to thing to combine a large number of accurate sensors? What are the barriers to fast sensory integration today? In Engadget: Mapping interior spaces. Lenovo's Phab2 Pro has a lousy name, but Google's 3D mapping technology could make it a game changer. ... "
Google and their deep dream experiment.
" ... Google's latest VR experiment involves feeding footage captured by its 360-degree camera rig through the DeepDream machine. Since the company's DeepDream program uses a neural network to transform ordinary images into surrealistic, dream-like artwork, the result is a psychedelic virtual reality experience. If you'll recall, the big G's 360-degree VR platform is called Jump, and it uses a 16-camera circular rig co-designed by GoPro. Google has been uploading videos taken with the rig on YouTube for a while now, but this particular experiment is something new. .... "
Addressing the opportunity in outwardly boring businesses. Good overview.
" .... To get the best deal on each leg of the journey and handle the hand-offs through customs, freight forwarding services serve as an organizational logistics layer. They have direct relationships with carriers like truck owners and massive shipping container boats. But like I said, it’s an unsexy business, so until recently, freight forwarding was still being done with a jumble of Excel, email, fax, and paper manifests shipped around the world. That made it extremely tough to spot overspending or snags in supply chains. That is, until Flexport indexed all the available carriers into a searchable database in its free software for organizing and tracking shipments. ... "
Siri was the first general assistant of its kind, but despite the fact that I have had it at my fingertips for a long time, I find myself using it less. My take is that assistants need a focusing usage to make them work. More in Wired. An indication of seriousness, business adapts to needs. Here we are starting to build libraries of virtual reality content.
" .... In the past, there was not a strong need to have technology ethics embedded into machines, because most systems had merely automated tasks, or operated under direct human control, explains John P. Sullins, a professor of philosophy at the Center for Ethics Value and Society at Sonoma State University in California. As autonomous machines step, roll, and fly into our lives, however, there is a growing need to draw on elements of psychology, sociology, philosophy, anthropology, theology, actuarial science, political policy, and law to guide actions and machine behavior. This translates into hierarchies or scoring systems that sort through real-world events and guide automated decision-making. .... "
It’s become well established that the blockchain has an almost infinite range of functional applications outside of pure financial transactions. This is particularly pertinent when it comes to the Internet of Things where technology is being used to disrupt a range of traditional industries. One team has found a novel way to address these inefficiencies and authenticity challenges through the blockchain. In January Dominik Schiener and his team won first prize at the Shanghai Blockchain Hackathon for their project Cargochain. We saw their work recently here in Berlin where they won the silver medal at the GTEC Blockchain Innovation Awards and I met with Dominik to learn more about it. ... "
In Innovation Excellence: I like this because it combines art and science. " ... Great innovators are not just smart, they are curious. They are rarely purists or polemicists, but are courageous enough to venture outside their domain. Vannevar Bush, who created the post-war architecture for scientific funding that made America an innovation superpower, warned against excessive focus on purely scientific pursuits: ... "
This article was originally written for my exclusive column on mycustomer.com – a hugely valuable and rich resource of information, expertise and inspiration for CX Professionals. You can find the original article here. ... "
Phones sensing their environment in new ways. Have tracked the Project Tango idea for some time. An inverse of the beacon idea, with initiative given to the consumer device. Implications? More in CIO Today.
" .... We're about to get our first look. On Thursday, Lenovo will give consumers their first chance to buy a phone featuring Google's 3-year-old Project Tango, an attempt to imbue machines with a better understanding about what's around them. Location tracking through GPS and cell towers tells apps where you are, but not much more. Tango uses software and sensors to track motions and size up the contours of rooms, empowering Lenovo's new phone to map building interiors. That's a crucial building block of a promising new frontier in "augmented reality," or the digital projection of lifelike images and data into a real-life environment. ... "
Video " ... Random forests, aka decision forests, and ensemble methods. Slides available at: http://www.cs.ubc.ca/~nando/540-2013/... Course taught in 2013 at UBC by Nando de Freitas ... "
There is still a considerable way to go, but we have been shown that voice has real value. Most important, we need to accurately define the nature of a conversation and its expectations, when interacting with devices. Many challenges still exist. But it is quickly becoming clear we are entering a new phase of digital interaction as technology giants Amazon, Apple, and Google bet on voice-based systems. ... "
Nice set of challenge examples in OpenAI, give you a good idea of the possibilities of deep learning applications. Will continue to follow this as it overlaps with my areas of interest. Thoughts?
" .. It's easy to get started in deep learning, with many resources to learn the latest techniques. But it's harder to know what problems are worth working on. We're publishing a living collection of important and fun problems to help new people enter the field, and for enthusiastic practitioners to hone their skills. Many will require inventing new ideas. Once solved, you can submit a pull request linking to your solution. We'll accept multiple interesting solutions to each problem. ... "
A use case for Machine Learning – migration simplification. By its nature machine learning does promote opportunities for simplification. Can think of several not related to this. In Techrepublic " SAP invests in machine learning to simplify customer transition to cloud ... SAP believes it has the capabilities to deliver machine learning solutions to help customers improve their end-customer journey and tackle issues that were previously too costly. .... "
“Solving Large-Scale Machine Learning Problems in a Distributed Way” by Martin Takac, Assistant Professor, Lehigh University, gave a great presentation today on “Solving Large-Scale Machine Learning Problems in a Distributed Way” as part of our Cognitive Systems Institute Speaker Series. Please continue the conversation here with Martin, who's research can be found here: http://mtakac.com/ To see and hear a replay of today's presentation, go to: http://cognitive-science.info/community/weekly-update/ and select recording next to June 9, 2016 presentation. The slides with references are also available at this link. .... "
With the excitement growing as Facebook's Oculus and HTC's Vive hit homes, the tech industry has begun to pay close attention to the sleeping giant of Augmented Reality.
" ... AR takes a user's reality and "augments" it, adding to or changing the world that the user can see. Many companies have emerged in the space, including Magic Leap, which has raised over $1.1 billion in funding despite relative secrecy and Meta, which recently debuted a headset that augments the world around you, but requires a PC connected to work and is yet to ship. ... "
Artificial Intelligence (AI) and Deep Learning technologies are impacting many aspects of our lives. In future, this impact is expected to accelerate to many more areas including Smart cities. Many of the future problems facing city planners such as driverless cars, use of drones etc impact multiple facets in cities. To address them through AI technologies, we need to think beyond the current silo-based approach. We need to look to the interconnections between city areas. ... "
In Siliconangle: Every smart building should generate data. From its processes, systems and devices. That data should then be converted by analytic methods. Then communicate with the people and 'things' we need to work with. Nicely done. So you’ve gone through the Computerworld Beginner’s Guide to R and want to take some next steps in your R journey? In this advanced beginner’s guide, you’ll learn data wrangling, best packages to use for different tasks, how to make maps with R and more .. "
Interesting that Accenture openly uses the term AI. NEW YORK; May 16, 2016 – Accenture (NYSE: ACN) and IPsoft today announced the creation of an Accenture Amelia practice, designed to accelerate client adoption of artificial intelligence to improve business outcomes and create new growth opportunities for their businesses. Accenture will utilize IPsoft’s Amelia platform to develop go-to-market strategies, solutions and consulting service offerings around deployments of virtual agent technology for clients across several industries with initial focus on banking, insurance and travel. .... "
A look at some additional cloud based AI skills beyond Echo, Siri and Cortana Not all are available today, notably long expected Samsung's Otto home control and camera system. I was offered an early beta of that example, but am still waiting. More on conversational Advertising, today in AdAge. This could be the first time that ads truly become a 'conversation'. See my other posts on previous experience and findings in this space. How does this relate to Bots? The biggest technology players are in a mad dash to develop the smartest conversational interface. ... "
From Augmented Pixels, a ompany I have had some conversations with, with a touch of space modeling? Another Tango? More about Augmented Pixels. Some early comments in RetailWire with discussion about Watson Ads by retail oriented tech practitioners. See my previous link on this, will be closely watching progress. Will shoppers want to interact with AI ads? The Weather Company, acquired by IBM in January, will begin rolling out digital ads that people can communicate with this fall. Powered by IBM Watson’s artificial intelligence, consumers will be able to ask questions via voice or text and receive relevant information about the product or offering. The first companies to tap Watson ads will be Campbell Soup Company, GSK Consumer Healthcare and Unilever. Unlike ads tied to keyword searches, Watson Ads are able to pick up the nuances of natural language. ... "
" .... In the not-so-distant future, we will begin entrusting to robotic systems such vital tasks as driving a car, performing surgery, and choosing when to apply lethal force in a war zone. As we describe in this report, ever more autonomous machines will present challenges spanning technical, regulatory, and even philosophical realms. They will force us to confront deep moral quandaries, and might even tweak our sense of who we are. ... "
In McKinsey: By capturing and analyzing social-media conversations, companies can improve their offerings and margins. A look at a Wal-mart Superstore of the future. Slide show of mostly redesigns. Not too unexpected regarding technology involved. Apparently largely as a response to Target redesigns.
" ... Researchers at the Institute for Quantum Computing (IQC) at the University of Waterloo developed the first available software to evaluate the security of any protocol for Quantum Key Distribution (QKD). QKD allows two parties, Alice and Bob, to establish a shared secret key by exchanging photons. Photons behave according to the laws of quantum mechanics, and the laws state that you cannot measure a quantum object without disturbing it. So if an eavesdropper, Eve, intercepts and measures the photons, she will cause a disturbance that is detectable by Alice and Bob. On the other hand, if there is no disturbance, Alice and Bob can guarantee the security of their shared key. ... "
In Forbes: " ... These DARPA Darlings Just Raised $20M To Build A Super-Powered Google For The Internet Of Things ... " by Thomas Fox-Brewster . Good to see some of the ifrastructure process needs are being considered. Face recognition app taking Russia by storm may bring end to public anonymity ... FindFace compares photos to profile pictures on social network Vkontakte and works out identities with 70% reliability ... "
The IFTTT describes and supports a set of recipes for action based on information channels. Simple, and a great place to start. But why not take the idea beyond the simple idea to implement embedded algorithms, and allow the simulation of the results actions under varying conditions? A form of agent model. There are now 314 channels, includes connections to Samsung and GE Smart applicances. From the BMW automotive lab, home smart security systems, Amazon Echo and much more. Each channel has demonstrations of how it can be used. Allows you to trigger reactions based on input from channels you connect to. A good demonstration of a simple internet of things. I have a nice collection of triggers in place now. It needs more participation and creativity. More on IFTTT, with many business and home examples. Computers excel at finding a signal in the noise, but we're still wary of AI doctors. ... "
... Once companies are logging and storing detailed data on all their customer engagements and internal processes, what’s next? Presumably, firms are investing in big data infrastructure because they believe that it offers a positive return on investment. However, looking at the surveys and consulting reports, it is unclear what the precise use cases are that will drive this positive ROI from big data. Our goal in this article is to offer specific, real-world case studies to show how big data has provided value for companies that have worked with Microsoft’s analytics teams. These cases reveal the circumstances in which big data predictive analytics are likely to enable novel and high-value solutions, and the situations where the gains are likely to be minimal. ... "
In Inc. This is becoming an important skill. " ... 7 Ways to Identify and Evolve With Industry Trends ... You can keep up with and be part of the changes, or you can overlook and ignore changes and let others pass you by. ... "
I’m betting BIG on the concept of the employee experience which I believe is the next evolution of HR and people related functions inside of our organizations. We are already seeing employee experience related roles and executive titles emerge and the very concept of Human Resources if morphing into something else (a topic for another post). Everything around people analytics, workplace design, compensation, engagement, well-being, etc is all tied to this concept of creating an environment where people actually want to show up, not where they need to show up. To help explain what the employee experience actually is I created the visual below which shows what I like to call The Employee Experience Equation. This is: culture + technology + physical space = employee experience. .... "